The 1951 Buick front wheel suspension allows each front wheel to rise and fall, due to change in road surface level, without appreciably affecting the opposite wheel. Each wheel is independently connected to the frame front cross member by a steering knuckle, steering knuckle support, lower control arm assembly, and an upper control arm on the shock absorber. See figure 6-1. Rubber seals are installed on lower control arm shafts and on lower and upper pivot pins to exclude dirt and water from the threaded bearing surfaces. Lubrication fittings are pro- vided at all bearing locations. 1951 Buick rear wheels are not independently sprung since they are mounted on axle shafts incorporated in the rear axle assembly. The rear wheels are held in proper alignment with each other by the rigid construction of the rear axle housing. They are held in alignment with the rest of the chassis by the torque tube and radius rod between car frame and the rear axle assembly. Two coil type chassis springs are mounted between the frame cross member at top of kickup, and spring seats welded to the axle housing near each end. Ride control is provided by a double-acting hydraulic shock absorber mounted on each rear brake backing plate and connected to the frame by a rubber bushed steel link. Side sway of the chassis springs and -rear end of frame is prevented by the transverse radius rod. Large rubber bumper and rubber rear axle stops are bolted to lower flange of frame side rails over axle housing to limit travel of axle housing during compression of the chassis springs. See figure 6-5. 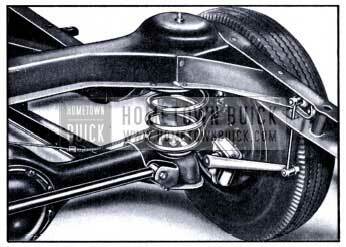 The 1951 Buick front chassis springs have a small coil at the top end only, which fits around a center cup attached to the frame by one shock absorber bolt. A rubberized fabric insulator is located between upper end of spring and the frame. The 1951 Buick rear chassis springs have small coils at both ends. The upper end of each spring is attached to the frame by a bolt and clamp. A rubberized fabric insulator is located between upper end of spring and the frame. Another insulator is located between the spring clamp and the flat washer on attaching bolt. The lower end of each rear spring is attached to a spring seat on rear axle housing by a spring clamp and bolt (Ser. 44-50-70) or stud (ser. 40). 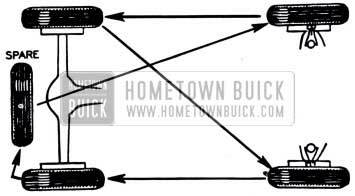 All 1951 Buick front chassis springs are identical in appearance, and rear springs also, Chassis springs are of different load capacities for different models; therefore springs may not be interchangeable between models. Each spring has the part number stamped on one end coil for identification. The correct spring to use for each model is specified in the Master Parts List. Delco double acting, opposed piston type hydraulic shock absorbers are used on all models. 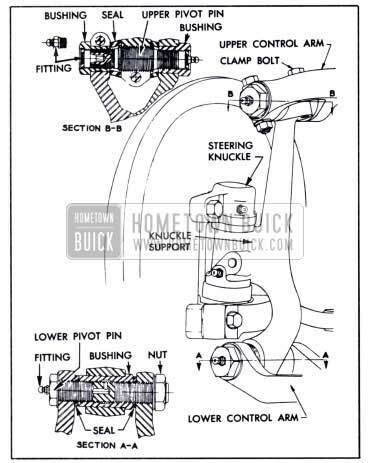 1951 Buick front shock absorbers are mounted on top of frame front cross member. Two of the three attaching bolts fit in reamed holes to insure correct alignment of shock absorber with other front suspension members. The arms which are welded to outer ends of shock absorber camshaft form the upper control arms of the front wheel suspension system. Right and left shock absorbers are identical and interchangeable, however, calibrations may differ between car models. Shock absorber calibrations for each model re given under Specifications (par. 6-1) and are also given in the Master Parts List. The manufacturer’s model number, coded date of manufacture, and the calibration code numbers are stamped on one end cap of each shock absorber. 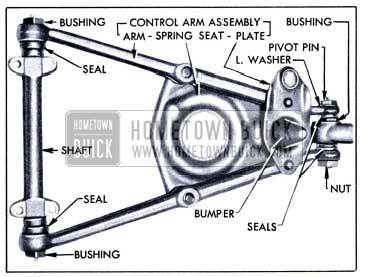 The 1951 Buick shock absorber body contains a fluid reservoir connected to two cylinders in which rebound and compression pistons operate. Both pistons are fastened together and are simultaneously actuated by a cam located between their inner ends. The cam is mounted on a shaft which extends through both sides of the body and is rotated by the upper control arms serrated to the outer ends. The rebound piston and cylinder are toward the upper arm. See figure 6-6. 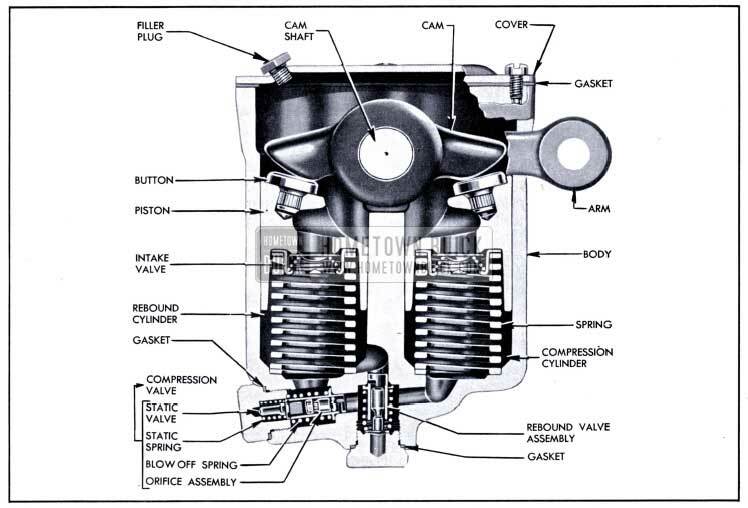 As the 1951 Buick shock absorber arm moves downward, due to car spring rebound movement, pressure set up in the rebound cylinder forces fluid through the bleeder hole or opens the rebound valve by compressing the valve spring; at the same time, the compression valve moves off its seat in the body, due to the partial vacuum created in the compression cylinder, and the compression cylinder is filled with fluid. As the shock absorber arm moves up, pressure set up in the compression cylinder forces fluid through the bleeder hole or opens the compression valve by compressing the valve spring; at the same time, the rebound valve moves off its seat in the body, due to the partial vacuum created in the rebound cylinder, and the rebound cylinder is filled with fluid. Thus, the action of the fluid is the same in both the rebound and compression cylinders, but the rate of movement of the arm up and down is controlled by the size of the bleeder hole and weight of the spring of the rebound and compression valves. Delco double acting, parallel cylinder type hydraulic shock absorbers are used on all models. 1951 Buick rear shock absorbers are mounted on the brake backing plates and the arms are connected to the frame by non-adjustable rubber bushed steel links. Right and left rear shock absorbers are identical in design but are not interchangeable. Calibrations for each car model are given under Specifications (par. 6-1) and are also given in the Master Parts List. Calibration code numbers are stamped on the valve nuts of each shock absorber. 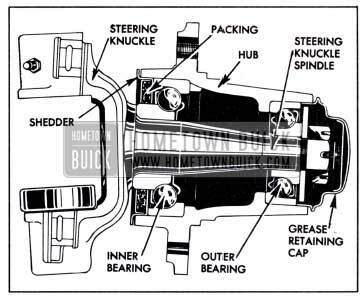 The 1951 Buick shock absorber body contains a fluid reservoir above two parallel cylinders in which compression and rebound pistons operate. Either piston is moved downward by a cam located to bear against the upper end of the piston; while one piston is being moved downward by the cam, the other is moved upward by a heavy coil cap spring. The cam is mounted on a shaft which extends through one side of the body and is rotated by the shock absorber arm attached to the outer end. The compression piston and cylinder are toward the shock absorber arm. See figure 6-7. While the action of the rear shock absorbers is similar to the front shock absorbers (par. 6-5), they are much faster acting due to the drilled passage from one cylinder to the other. 1951 Buick wheels are demountable disc type with the rim welded to wheel disc to form a unit assembly. The wheels have wide drop center type rims designed to give ample support for the tire sizes used as standard equipment. The 1951 Buick rims have tapered tire bead seats which cause tire beads to wedge tightly in place when tires are inflated. 1951 Buick tires on all models are low pressure balloon type, made of a combination of synthetic and natural rubber. Tubes are made of synthetic rubber, which has the advantage of holding air pressure somewhat better than natural rubber. Standard production tire sizes are given in paragraph 6-1 (d). All 1951 Buick tires and tubes used as standard factory equipment have been worked out with the tire manufacturer for stability. This does not imply that other makes and types of tire and tubes are not suitable for Buick cars, but owing to the large number of tire and tube makes and designs it is impossible for ride and handling calibrations to be worked out for each one. 24 lbs. Starting Pressure-after car has been standing for 3 hours or driven less than one mile. In temperatures below freezing, inflate tires 2lbs. higher. 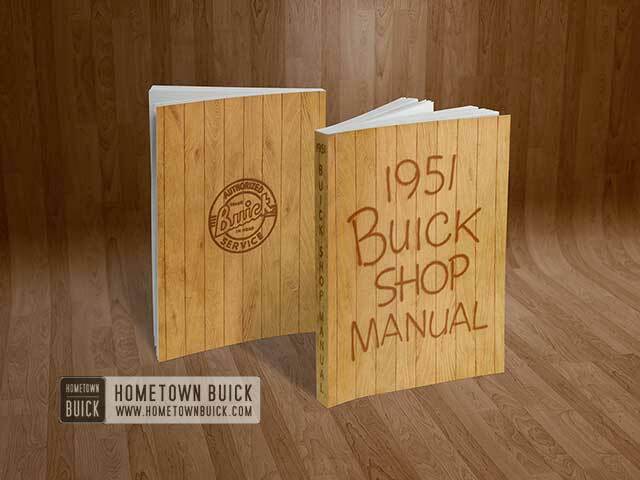 All 1951 Buick tires should be inspected regularly to avoid abnormal deterioration from preventable causes. If tires show abnormal or uneven wear the cause should be determined and correction should be made. Cuts in a tire which are deep enough to expose the cords will allow dirt and moisture to work into the carcass and ruin the tire unless promptly repaired. Attention to cuts and cracks in tires containing synthetic rubber is particularly important because cuts spread more’ rapidly in synthetic than in natural rubber. Shallow cracks or cuts may be arrested by grooving but deep cracks or cuts should be repaired promptly. 1951 Buick tires tend to wear unevenly and become unbalanced as mileage accumulates. Uneven tire wear is frequently the cause of tire noises which are attributed to rear axle gears, bearings, etc., and work is sometimes needlessly done on rear axles in an endeavor to correct the noise. Do not use tire chains on the 1951 Buick front wheels under any circumstances because they will interfere with the steering mechanism. Any of the conventional full-type non-skid tire chains can be used on the rear wheels.